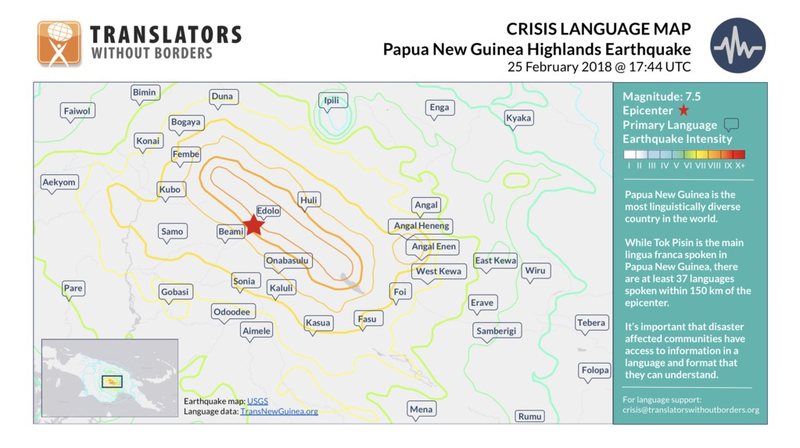 On 25 February 2018, a M7.5 earthquake struck the island of Papua New Guinea, displacing over 26,000 residents and leaving 270,000 people in need of assistance. At least 53 people have died as a result of landslides and structural collapse. Women, men, and children who have had to leave their homes speak a variety of languages and may struggle to obtain relevant, timely information. Papua New Guinea is the most linguistically diverse country in the world. More than 820 languages are spoken in total, including close to 40 languages within 150km of the epicenter. Tok Pisin is the main lingua franca, along with English, but around half the population do not speak Tok Pisin and highland and lowland regions use different dialects. In times of need, communication with communities is key. Yet disasters often strain local communication infrastructure, and those who provide language services may themselves be affected. To alleviate suffering and contribute to rapid recovery, it is important to get life-saving information to communities quickly, through radio broadcasts and mobile technology, in the languages of those affected. To ensure understanding among less educated individuals and second-language speakers, communication should be short, simple, and clearly illustrated. Important information – such as how to access services and where to report abuse – should be provided in plain language, absent of jargon, and with pictures when possible.